Cairns is one of the most beautiful parts of Australia. Thousands of tourists and natives flock there each year to enjoy beautiful, tropical surroundings and the Great Barrier Reef. While the National Broadband Network (NBN) isn’t quite as beautiful as Cairns’ more exotic offerings, it is a reason to be excited. Users in the far north of Queensland are either already able to enjoy the incredible speeds of the system or soon will be. Check out iiNet’s FAQ page to get more information about just what the NBN can do for you. 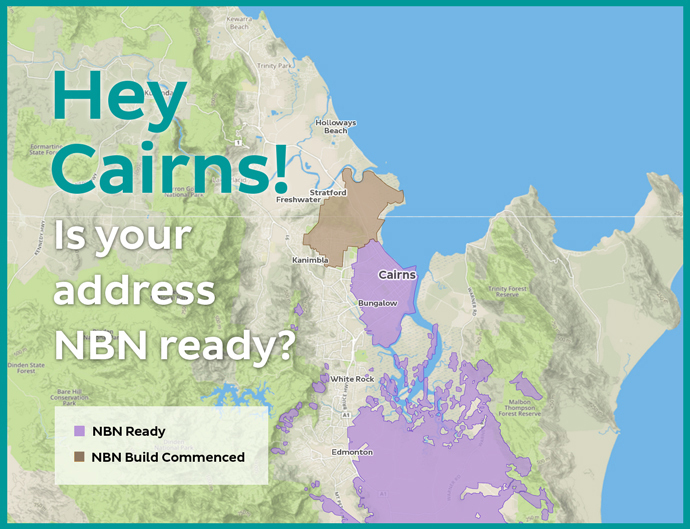 While the NBN Coverage Checker can give you a more precise idea about whether or not your location is equipped with connectivity, it’s pretty easy to get a clear picture of the status of the NBN in Cairns. Starting south, just north of Deeral, a strip of NBN sites stretches along the coast more or less all the way up to Ellis Beach. Operational sites near Deeral, between Fishery Falls and Aloomba, to the east and west of Gordonvale and in Packers Camps, create a large patch of NBN connectivity that includes those towns along with Green Hill, Wrights Creek and parts of Mount Peter. Another small pocket of operational NBN sites can be found just north, covering Portsmith, Parramatta Park and Cairns North. To the west of those two patches are sites that are being prepared for building. These cover Edmonton, Bentley Park, Mount Sheridan, White Rock, Bayview Heights, Woree, Earlville, Mooroobool and Brinsmead. To the northeast there are sites on which building has started that will cover Whitfield, Edge Hill, and Aeroglen. The other chunk of Cairns that currently houses NBN sites is just north of there. It starts in the northern section of Caravonica and moves up Highway 44 toward Smithfield, Trinity Park, Trinity Beach, Clifton Beach and up to Palm Cove. Those towns, along with Yorkeys Knob, have sites that are being prepared in addition to a few scattered operational sites. If the NBN Wait List is not yet in your area, you can put your name on the NBN Wait List to receive updates about building progress. While you wait for your area to be connected, check out iiNet’s NBN plans and choose which is best for you.